Having heard about this great ski peak from a trip leader of the Ski Mountaineers, I discerned the elevation and location, and then scheduled a joint trip with the Ski Mountaineers. For most people, skiing at this time of the season is absurd. The resorts are closed, and much of the snow about the Northern Sierra is gone. But, it is the perfect time for the High Sierra. The snow lingers late, as the high altitude keeps it from melting too quickly. Some fluke of nature keeps the snow excellent for spring skiing. Leaving right after work again, I drove, taking Dave and Jim and our gear in my subcompact wagon. Many other chapter skiers gave a thumbs down on this adventure. They would never believe or accept that this weekend was the finest skiing and biggest ski peak adventure that was ever done for this chapter. As we got gas on Highway 16, choosing to go over Highway 88 to U.S. 395, other drivers pointed and shouted to us. We had skis on the roof rack. Kirkwood was closed. Smiling, I drove on. I knew much, much better. We met the SMS group the next day, at the junction of the roads to the lakes, on Highway 168, at 8 a.m., after a fine breakfast in Bishop. This year, there was plenty of snow. Driving to the plowed end of the South Lake Road, we parked and prepared our things. The wind had been up, but conditions were getting better. You couldn't imagine how excellent it would be! The road was closed a bit down from the South Lake trailhead parking lot. We skied up with full packs to the dam, and surveyed the scene. The goal for today was to ski to basecamp. That would be at least the other side of the lake. The water was partially drained from the reservoir. The lake ice had collapsed, leaving cracks and crevasse-like conditions. We skied carefully over this. One could conceivably fall into a big crack and go under water. We hurried to the other lake shore, and traversed upward south along the far reservoir shore. Dave doffed his pack, and skied a few turns already. By about noon, we came to a good campsite at about 10,000 feet elevation. The day was too good to sit around. Dave and Jim led the way, while the SMS group stayed in camp. They weren't having too good a time. Dave navigated with precision through successive bowls, then to a flatter area where we gained the view of shimmering snow slopes and the peak. It must have lightly snowed recently to smooth out the surface, and the warmer air served to soften, perfectly, the top inch or so. Not too much to turn it into mush! I stopped at the view of the peak, while strongman Dave skied nearly to the top of the peak. His whooping turns assured all of us that we would have a great, safe time. I appreciated his courtesy in not already bagging the peak. We began our ski descent back to camp. The S's were being laid already. Some local chapter skiers highly resent the ski qualifications that the SMS has set up. One big leader was so incensed that he put a copy of their safety policy into a trash can. You are required to have the firm ability to complete various ski turns and manuevers, as well as the endurance and muscle to complete an easy tour. Some local chapter ski leaders would fail. 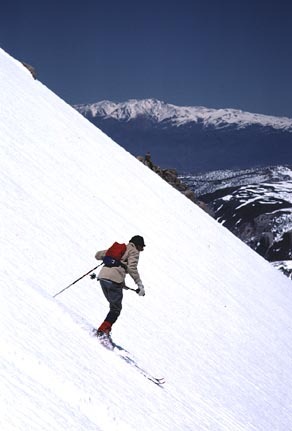 The kick-turn/traverse style of skiing is fine, if the snow only allows for that. But, not having the ability to make multiple turns in constant succession is not considered proficient skiing. The local chapter form can also be dangerous, as the SMS tours are planned for quick descents. A skier unable to descend, as the group did, could jeopardize everyone. That is exactly the level of some of the self-vaunted "expert" ski leadership of the local chapter. Back to camp after a glorious run, we made dinner. I enjoyed the alpenglow on Hurd Peak and Cloudripper. The night was pleasant. No wind, and not too cold. I woke up to crunchy snow, and got my Butane canister stove going quickly. I had my two man tent to myself. Outside, I had built a snow throne for eating and cooking. This is the way to go! We had no rush, since the snow had to soften before our big descent. In a leisurely fashion, we began moving. Four of us were to make the summit. Using climbing skins, we made a steep line past our S's of yesterday. The weather was good, and the conditions looked to be highly promising. We came to a rock, where we rested a bit. Dave led the way again. I could hardly stop or slow him. We traversed up the slopes, which became a slope angle of perhaps 40 degrees. I had concerns about being unable to stop sliding, if that occured. Rocks poked out at the base of the summit slope. We reached the top of the ridge, and skied over to the summit. I took off my skis only feet away from the rocky, peak highpoint. The skies were still clear, and everyone was pleased. There was even a register to sign-in. We had lunch, and then after pictures, I chose to head down first. I wanted photos of the group skiing. It was steep. I did a telemark. Made it! I did another. Well! I touched my knee to the snow after another, which I consider a fall. Then, I was level with the steepest section. The others began to ski down. I snapped away. It was the best skiing photography that I have done to this point. Awesome! The fast, quick turns were preserved for all time. Unbelievable! Jim took a section which looked impossible. Snap! I skied down as the others did. Snap again! It was a scene, with bergshrunds below us, from snowfields up to fantastically steep couloirs. Mt. Gilbert had a gigantic cornice. It must have been a hundred feet thick. This was a Sierra ski experience of a lifetime. The angle lessened lower down, and I skied a lot better without having to think of the rocks below. 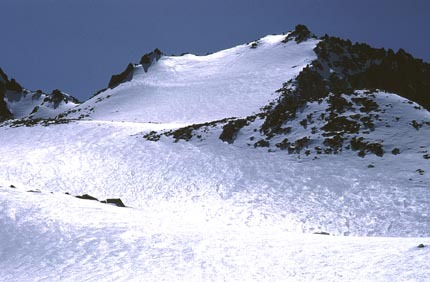 We had the immense ski bowls to descend. This should last forever! Telemark, stem, and parallel turns were all working. Life is too short. Back to camp, we packed up. The glare of the sun on the snow was hot. A timely traverse along the far lakeshore, then our route over the broken lake ice made for more photos. We had to doff skis to climb up to the road along the dam. Another solo skier had his time somewhere. He was pleasantly tired. I was all hyped up. We all came back to the cars, and started the drive home. We took a progressive dinner, stopping in Bishop for drinks, Mono Lake for dinner, then Minden for milkshakes. Home by midnight, I must have had the best tired sleep that I have ever had. I had used my then new Fischer Europa 99 skis with standard three pin bindings. My clothes were getting worn from all the use. I was to schedule this event again, but the snowfall was less that next year. We still skied the peak, but not as enjoyably, with icier conditions. I still sign up for SMS trips to do this peak, but have not yet heard of as great conditions as we had this day. Our ski stats were over some 10 miles with 6,300' gain round trip. It was a bit more for Dave.